Art Gallery Cards: CASE'ing Going Globa! Cardmaking Fun With New Occasions Products! CASE'ing Going Globa! Cardmaking Fun With New Occasions Products! I confess to happily case'ing one of wonderful projects wee got to make at November's OnStage Event in Tampa! 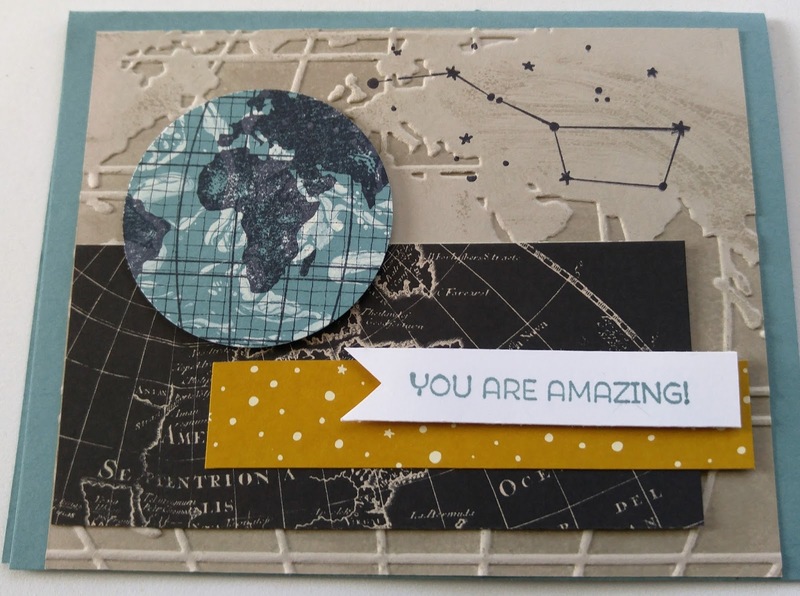 I immediately fell in love with the Going Global Stamp Set, the Going Places 6" x 6" paper stack and the World Traveler Textured Impressions Folder. We made these cards in my classes last week. Some were valentines, some were birthday cards and some were congratulatory cards. How versatile can one group of products be???!!! We lightly inked the top inside folder of the embossing folder with the Crumb Cake Stamp Pad, inserted the Crumb Cake 4" X 5 1/4" paper, ran it through the Big Shot and got really interesting results in each case. I really LOVE creating with my stamp groups! They are all so creative and fun to be around!! Lucky me and counting my blessings!! I wish you a glorious, creative week!